Products from Merrell at reduced price!! Amazing Products from Merrell at reduced price!! The leading comfort footwear retailer Merrell has reduced prices for hundreds of fashionable styles featuring unique comfort technologies to make all-day walking look and feel great. New and amazing products from Merrell in this season’s collections make it easy to go from day wear to nighttime, from the office to outdoor patio parties. Merrell shoe’s have been constantly improving their product quality and durability of all of their products by using high end technology and rigorous testing procedures. Recently they have come out with amazing line of products which comfortably fits in the foot of the fashion and comfort loving women. Comfort, style and beauty combine in the Merrell Agama Black Slate.The lining features the Aegis® antimicrobial solution, which will keep your feet cool and dry. Padded insole for all day wear. Hook and loop closure for a secure and adjustable fit. Merrell Rugged Sandal Sole that is durable and slip resistant. Full grain leather upper. Lycra® neoprene lining for an abrasion free environment. They turned out to be the most amazing, supportive, comfortable pair of shoes. Leather rear foot sling provides stability. Integrated microfiber footbed treated with Aegis®, is breathable and supportive. Vibram® Traction Glove Sole is durable, slip resistant, and shock absorbent. Fused rubber toe bumper provides ultimate durability. Synthetic leather rear foot sling provides stability. Non-removable microfiber footbed treated with Aegis® antimicrobial solution resists odor. 1mm forefoot shock absorption plate maintains forefoot flexibility and protects the foot by distributing pressure. Vibram® Trail Glove Sole with Rubber compound provides shock absorbency and comfort. Comfortable Microfiber and breathable air mesh upper. Merrell Omni-Fit™ lacing system secured with welded TPU provides a precise, glove-like fit. You will love wearing these amazing products from Merrell, which gives you the luxury of great comfort and style.Comfortable casual shoe from Merrell. Removable EVA foot provides cushioning and support. Compression molded EVA foot-frame for stability. Sticky Rubber outsole is durable, slip resistant, and shock absorbent.Pig suede leather and mesh upper for style and comfort. Breathable mesh lining treated with Aegis® antimicrobial solution, will keep your feet cool and dry. Strobel construction for increased durability and support. Vibram® Chrysalis Glove and TC1 Rubber outsole, is durable and shock absorbent. Integrated microfiber footbed provides cushioning for all day wear.Comfortable casual shoe from Merrell.Synthetic leather and breathable air mesh upper. Lining treated with Aegis® antimicrobial solution, keeping your feet cool and dry. Comfortable casual shoe from Merrell.Vibram® Cambrian Sole/ Sticky Rubber for increased durability and comfort.Waterproof and pig suede upper that is waterproof and durable. Lycra® neoprene lining for increased comfort. Buckle strap at the instep. The lining features Aegis® antimicrobial solution, to help keep your feet cool and dry. The EVA footframe provides support, comfort and stability. Merrell QForm® Comfort midsole provides women’s specific stride-sequenced cushioning. Heel features air cushion which provides shock absorption and increased stability. Walkingonacloud’s is in the last month of our Semi Annual sale. More great styles, from some of the best brands in the shoe industry have been reduced in price. Hurry, this huge sale ends on September 1st. Great styles from Ecco, Pikolinos, Rieker, Josef Seibel, Clarks, Merrell, and many more, are ready to be shipped. 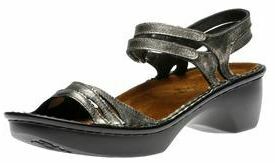 For all of you who enjoy a nice stroll in the city, the Ecco Women’s Hill Light V Oyester 24654 is a great choice. This super comfortable leather shoe features three adjustable velcro straps that will provide a secure and customized fit. The padded insole, which features the ECCO Comfort Fibre System, will increase comfort, and reduce foot and leg fatigue. The Women’s Josef Seibel Caspian is also a great choice, for those who want a light comfortable shoe. This fabulous product features premium leather uppers that will easily mold to your foot. The Caspian features a removable leather insole, and leather lining that will keep your feet cool and dry, during those hot summer days. The All Rounder by Mephisto Sprint is a superb hiking shoe with a removable insole. The Sprint features a nubuck leather strap, and a shock absorbent rubber outsole, that will make those long summer walks easy and fun. 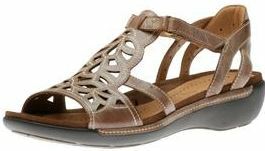 If you want to take advantage of the last sandal days, the Dansko Sandi is a great choice at a great price. The Dansko Sandi features adjustable leather straps, and a 3 inch stacked heel. The Dansko Dri-lex lining will wick moisture away from your foot, and the outsole will provide shock absorbency. Walking on a Cloud also carries the Rieker Vanessa R1652-09. 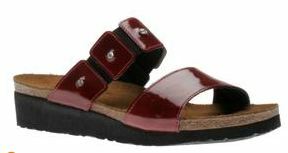 This light weight leather sandal features the Rieker padded insole, and an adjustable leather strap. The polyurethane outsole will reduce foot fatigue, while the leather lining will keep your feet dry. For Men, the comfortable Merrell Refuge j38991, is a terrific hiking shoe. The Refuge is made with nubuck and mesh, to provide a breathable and comfortable fit, for long hikes. The Aegis® antimicrobial lining will reduce foot odor, while the Ortholite® anatomical footbed will maximize comfort and support. The Vibram® Refuge Sole will allow you to walk securely on any surface. The Clarks Wave Tram for Men, is also a great choice, for easy and comfortable walking. The Nubuck leathers are durable and soft. This supportive walking shoe features the Clarks OrthoLite® footbed that will enhance support, while the padded tongue will hug your foot. The Ecco Men’s Yucatan sandal features Nubuck leather uppers that will provide durability and comfort. 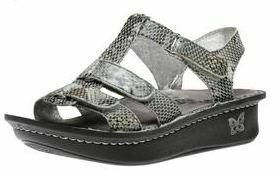 This great sandal from Ecco, features three Velcro straps that will allow you to customize your fit. The padded insole will allow you to walk comfortably all day. Get Happy Feet with Alegria Shoes at Walking on a Cloud. ALEGRIA shoes, known for its whimsical colors and unique patterns as well as for its body benefit features is excited to launch the spring 2012 collection at Walking on a Cloud – a fresh, spirited line of fun footwear that brings happiness into every step, every experience and every adventure. Alegria takes fashion-comfort footwear to a whole new level with its ergonomic design, removable foot bed and rocker heel. Top quality leather provides superior comfort and fit to make each step a happy one. Standing out from the rest with its unique styling and recognizable shape, Alegria is the perfect way to step into both style and comfort. 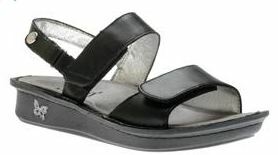 The VERONA is the second generation of the Alegria sandal. The Verona has a mini-rocker sole, velcro closure in three locations for a secure and custom fit, and a combination latex and cork foot bed that is designed to mold to the foot. The outsole is engineered to reduce heel and central metatarsal pressure, and the bottom is flat to increase stability. The mini-rocker outsole also propels you through the gait cycle, rocking you from heel to toe in a natural motion, resulting in less tired feet and body at the end of the day. A slight variation on the Alegria Classic, the SEVILLE has the same combination latex and cork foot bed that is designed to form to the foot. It has the added feature of a rotating strap that can provide a sling back for increased stability. If necessary, the foot bed is removable to allow space for custom orthotics, and the interior has extra depth to create a roomy fit. The outsole is engineered to reduce heel and central metatarsal pressure, and the bottom is flat to increase stability. The rocker outsole also propels you through the gait cycle, rocking you from heel to toe in a natural motion, resulting in less tired feet and body at the end of the day. The KLEO is a beautiful, gladiator-style Alegria sandal with three Velcro closures for custom fit. Stylish silver embellished hardware gives a fashionable look with providing full rocker bottom gives great support. The CARINA has velcro closure toe thong that has a secure and custom fit, and combination latex and cork foot bed that is designed to form to the foot. The outsole is engineered to reduce heel and central metatarsal pressure, and the bottom is flat to increase stability. The KARMEN has a double strap slip on style with embellished detail has a secure and custom fit, and a combination latex and cork foot bed that is designed to form to the foot. The outsole is engineered to reduce heel and central metatarsal pressure, and the bottom is flat to increase stability. Vintage and retro looks still symbolize our need for comfort, stability, and familiar surroundings. The theme is to be happy in the here and now. This allows ourselves to be impulsive, amused, healthy and fresh. There are three themes that incorporate the vintage and retro philosophy in season’s Naot Collection. 2) Light and Easy Patterns: Reflects an easy going woman. These sandals are handmade, pure and natural. They include prints and patterns and contrasted materials. These fabulous styles include Agile, Anika, and Pamela. 3) Deep treasures: These styles are original, innovative, and comfortable. These fabulous styles which include Secret, Concerto and Ashley, feature precious crystals for increased elegance. – Great for a more formal dress code with bold statements. These are versatile sandals, and they are great for work or a fancy dinner party.